Halloween is just around the corner and for most seasonal field service businesses, their offseason is about to begin. While kids around the neighborhood are getting ready to run around in their halloween costumes, there are a few things that spooky things that can be in the works before your business goes into hibernation mode. 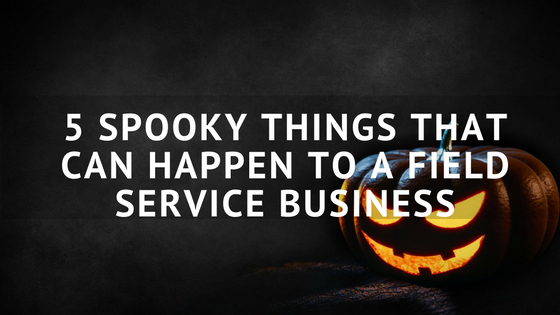 Here are 5 of the spookiest things that can happen to a field service business in the off season. One of the scariest things that can happen to a field service business is that their customers forget about them. You don’t need to have your customers on speed dial and you don’t need to be spamming their inbox with emails, but you should keep in touch. Have a regularly scheduled newsletter scheduled, send a holiday postcard and before the season begins again, you can even give your customers a call. Just like your customers, your employees can forget about you - and that is scary! One of the curses of seasonal businesses is the fact that you typically won’t staff employees year round. If they aren’t at the shop or onsite, they might have the “out of sight, out of mind” mentality. Most field service businesses can’t afford paying their employees a year round salary - for some employees, that isn’t an issue. They either find more work for the off season or they are able to make things work. Whatever the case is, you need to know if your employees will be coming back the following season. If you’re not planning and preparing for next year early on in the off season, you might be in a world of trouble when the season begins. Irrigation businesses have hundreds of startups, lawn maintenance businesses have spring clean ups and pool service businesses are opening up customers’ pools, all of which needs to be planned for. If you’re waiting until last minute to do all the prep work, you’re in for a scary situation. What happens if the parts that you ordered a week before your scheduled services don’t arrive on time? What do you do if you call up an employee a month before the season begins and they inform you that they aren’t coming back? You should have a plan in place for anything that can happen and you should be preparing yourself to handle any situation. Another freaky thing that can happen in the off season is out of whack financial statements. If you’re putting off taking care of your financials until right before tax season, you might be in for a rude awakening. Instead of putting your business’ well being at risk, do yourself a favor and speak with a CPA. In a recent webinar on BizLaunch, they recommended that all small business owners speak with a Certified Public Accountant, no matter how financially savvy you may be. They have seen how other businesses function and flourish in your area. It will leave you feeling better knowing that there won’t be any unwelcome surprises. The last thing that can be scary for field service business professionals is that they might not take a break! No matter what the profession, you should have some personal time to take some well deserved rest and relaxation. Take some time for yourself and your family and reenergize yourself before getting back at it next season. Want to know what isn't scary? Increasing your web traffic by optimizing your website. Download the free eBook, Local SEO for Green Industry Businesses!